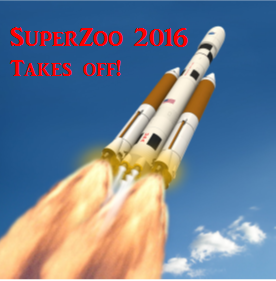 SuperZoo 2016 is ready to “Launch” – It’s huge! Where is it headed? SuperZoo was recently named one of the 50 fastest growing trade shows in America by Trade Show Executive Magazine. In August, you’ll see why. In response to industry demand, the WPA re-structured and increased the size of the show. The result: 200 more exhibitors (+20%). 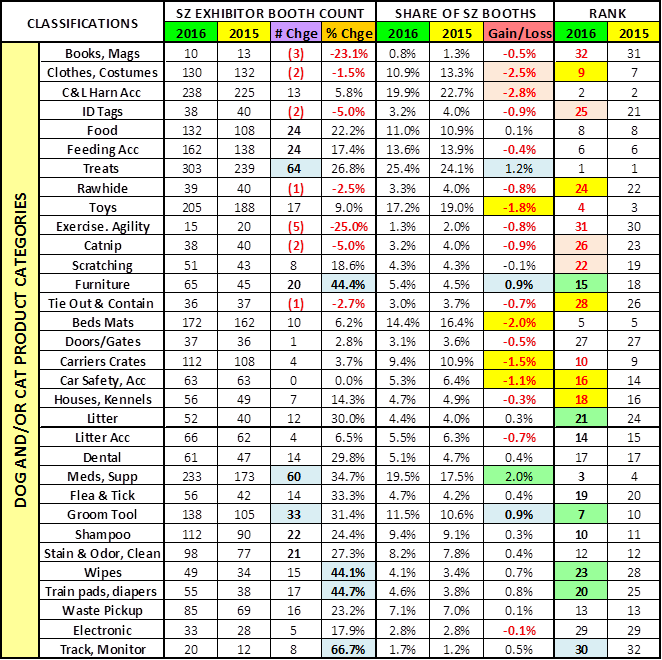 In this post we’ll take a look at the type of exhibitors and product categories that rushed to fill that space. But before we get started, let’s very briefly address the questions that always come up. GPE & SuperZoo – What’s the difference? Why do both? SuperZoo’s “roots” are that of a regional pet show. This history and their focus on the Grooming Service segment generates a higher percentage of pet retailers in attendance. One result of this is that there are more distributors and business service exhibitors. The GPE is the trade show foundation of the U.S. Pet Industry so it has always been the “must go to” show and has developed a larger International representation. However, you should always remember that pet products are sold in over 200,000 retail outlets in the U.S. and… the internet. This means that both shows have attendees from every retail channel and exhibitors and attendees from around the world. Logistically: The average GPE Booth is 50% bigger than SZ. The 10’x10’ is the most popular size booth at both shows. However, it is a much higher percentage of the total at SZ. With over 1700 total exhibitors and more than 41,000 in combined attendance….both shows are clearly a “must”. The special sections absorbed most of the growth and for the first time exceed 50% of the booths. Natural is the hottest “classification” in U.S. Consumer products. The Pet Industry is no exception. The expanded space also has allowed more 1st timers to attend. Critter Alley/Aquatic also grew significantly although this may just be exhibitors opting to move from the regular floor space to the special section. The Grooming Service Segment is a major priority and its growth rate exceeded the average. Rodeo Drive is the second largest section but remained stable in booth count and fell in share. One thing to remember is that there are plenty of exhibitors in the “open” floor space with products that would fit into these designated special sections. Perhaps, there was no room or they have a more diverse product line and don’t want to be limited by a narrow classification or….even more likely, they got a higher traffic location. Let’s look at the exhibitors by type, including animal. The increase in Business Services is incredible. It should be noted that while the bulk of these are aimed at retailers and groomers, there are some whose focus includes manufacturers. Increases in distributors and Gift/Gen Mdse also reflects the high number of retailers in attendance. Dogs and Cats are the animal royalty, with an exceptionally high percentage increase in cat products. All other animal types were down or about even in exhibitor count and universally down in share. Let’s take a closer look at the “royalty”. Here are the top 10 Dog and/or Cat Categories at SuperZoo 2016. Treats remain #1 and are growing even more widespread across exhibitors. Meds/Supplements had the largest percentage increase and is pushing Collars & Leads for the #2 spot. It should be remembered that many new Supplements are in the form of treats, driving the growth of both categories. Meds/Supp is also a big factor in the increase in Cat Products. Grooming Tools moved up 3 spots due to the strong and increasing appeal of SuperZoo to Groomers. Shampoos sneaked into the top 10. (Groomers again). Carriers/Crates fell from #9 to a tie for #10. Overall you can see that the industry recognizes the importance of SuperZoo to pet retailers and the fast growing Grooming Segment with the increase in exhibitors relating to these businesses. In terms of products, the growth is all in Dog & Cat. Treats continue to maintain their remarkable run and the growth in Meds/Supplements is nothing short of spectacular. On the downside, apparel may have peaked. 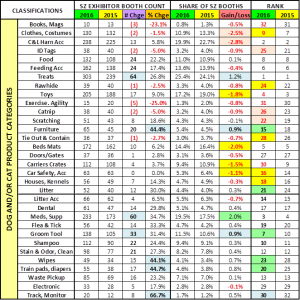 The chart below details the specifics for all 32 of the Dog/Cat product categories that I defined for SuperSearch. Of note: All the data inputs for this report and the SuperSearch tool were derived from reviewing the SuperZoo online exhibitor product listings AND then validated by visits to over 1100 websites and numerous separate internet searches. They’re not 100% accurate, but pretty close. NOTE: The SuperZoo 2016 SuperSearch Exhibitor Visit Planner has been updated as of 7/31. CLICK HERE TO GO TO THE SITE TO DOWNLOAD THE UPDATED TOOL! Now, back to our chart. Changes of special note from 2015 are highlighted. Which categories are of interest to your business? TAKE A LOOK, MAKE YOUR PLANS AND….SEE YOU IN VEGAS!